Multiple-time graphical analysis (MTGA) for tracers with reversible uptake (Logan plot with plasma input is used to estimate the distribution volume (VT) of the PET tracer. This method is also referred to as plasma reference graphical analysis (PRGA). If there exists a reference region with no specific binding, the distribution volume ratio (DVR), related to binding potential (BP) can be calculated by dividing the VTs with the VT from reference region. First step in the analysis the preprocessing of plasma input curve. The procedure is dependent on the tracer and study protocol. Generalized instructions on the preparation of input curves is given here. MTGA is considered to be robust enough not to require (usually) corrections for time delay or vascular volume fraction. The next analysis steps (drawing ROIs, calculation of regional TACs, and calculation of Logan plot, can all be done in Carimas or PMOD. Figure 1. 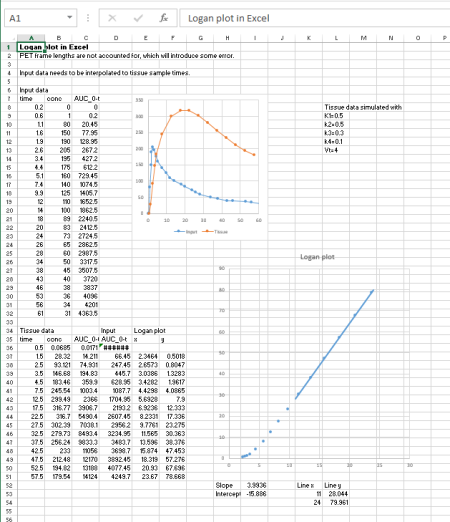 Logan plot is simple to calculate even in Excel. You can download Excel spreadsheets containing simulated data and formulas for Logan plot in two situations: input and tissue data have the same sample times (no interpolation needed), and input and tissue data have different sample times (interpolation required). If there are more than just a few studies to analyze, then calculation in Excel is too slow and error-prone, and use of Carimas, PMOD, or command-line tools (below) is recommended. MTGA methods produce correct results only if the slope is calculated from the linear phase of the plot, excluding the curvature in the beginning. You should always draw the Logan plots and control the linearity and quality of the data visually. The units of VT are (mL plasma)*(mL tissue)-1, if tracer concentration in plasma was given in per volume units (default in TPC), or (g plasma)*(mL tissue)-1, if tracer concentration in plasma was given per gram.